PLEASE VISIT AND LIKE MY FACEBOOK FAN PAGE HERE! Mark Hespeth is San Francisco Bay Area's Favorite Wedding Officiant. I am very excited to work with you! I am an ordained non-denominational Wedding Officiant, Wedding Minister and Celebrant. I perform marriage ceremonies for ALL couples declaring their desire to get married without any restrictions or limitations! I am the guardian of the ceremony. It is not "what" you say but "how" you say it that makes a difference. I make words come Alive! I will deliver your ceremony with warmth and good eye contact. I possess the highest standards in training and stage presence. I have great vocal skills and I will keep your guest interested and involved. I have successfully worked with couples from all walks of life, from all over the world with one primary purpose to unite forever in love. I am professional, personable, detail oriented and easy to work with. I have a passion for performing ceremonies rich in love, life and laughter. Whether you are planning a San Francisco City Hall Wedding, eloping to San Francisco, your wedding has been planned well in advance or is last minute, interfaith, traditional, non-traditional, themed or you just want something simple and sweet. I will see to it that your experience is smooth and stress free. I represent you as a couple and I will capture the love the two of you share on your wedding day. As a SF Bay Area Wedding Officiant, I am knowledgeable and skilled in wedding day coordination to create A Perfect Wedding Ceremony. I have established professional relationships and have partnered with the best photographers in the San Francisco Bay Area. I highly recommend IQphoto for your Special Wedding Photography needs and especially for San Francisco City Hall Weddings. I have excellent references. Please visit the Testimonials/Videos page, so that you will know what to expect when you select A Perfect Wedding Ceremony. 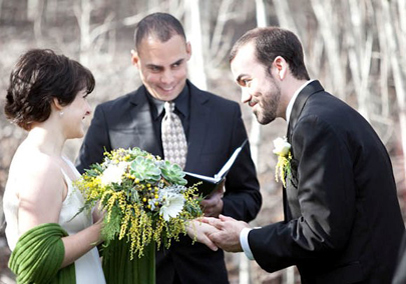 All donations offer the finest quality Wedding Officiant Services available, that you deserve as a couple. For detailed ceremony information and How this all works, Please view the Ceremony Information page. It is my privilege to create and perform your ceremony and share the excitement of your love and joy on your special day with you! Experienced, Dynamic, Professional, Detail-Oriented Wedding Officiant. A Unique Style and Method of Custom Ceremony Design. Great Vocal Skills-A Good Public Speaking Voice. Ceremony Donations Offered at an affordable price! Call or email to Reserve and Secure your ceremony date and time! I will complete and file your Marriage license to the County Recorder's office. Destination weddings, Short Notice weddings and Last Minute Elopements are always welcome. Unlimited Email and Phone Support for the Custom and Simple and Sweet Ceremony Packages. I highly recommend IQphoto, Emily takes Photos and SFCityhallphoto if you are planning a San Francisco City Hall Wedding.